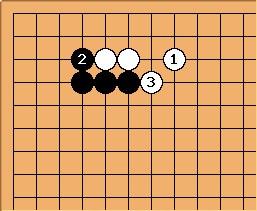 When black attaches on top with , white normally plays hane at . This page discusses what happens if white instead peeps with immediately. After the hane of , black can cut at , and sacrifice two stones. With , black gets influence in the center, after which black forces white to capture the two sacrifice stones with and (white captures at a). If white tries to play lighter with , black can still block in the corner. 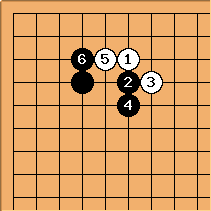 White then makes shape with , but his position is cramped. 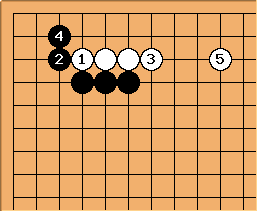 If white plays like this, black will hane. 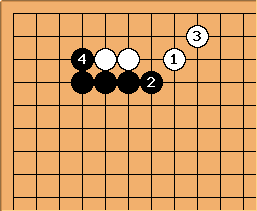 If white plays counter hane with at , black will get to play hane at the head of three on both sides. 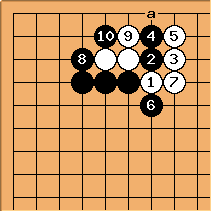 So white will probably extend, allowing black to take the corner. 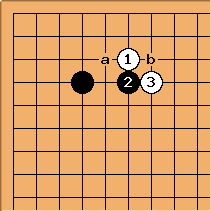 Here, white chooses due to the special circumstances of the position of the marked stones.